As luck would have it I started listening to this album just hours before Donald Trump won the US presidential election. The review itself was begun a week later, at a time of unprecedented soul-searching and questions of national identity. Amidst the turmoil American pianist Lara Downes’s thoughtful booklet notes and choice of programme celebrate all that is good about her homeland. How prescient – how necessary – that now seems; appropriate too, given that the album takes its title from the African-American poet Langston Hughes’ poem Let America Be America Again. The second line of the first quatrain, ‘Let the dream be the dream it used to be’, is especially poignant in these uncertain times. I must confess that Downes, a Steinway Artist, is new to me, although I see Byzantion has reviewed her Exiles’ Café. Those two collections focused on classical fare, but America Again, with its smattering of folk, show and film tunes, belongs in the crossover category. Sono Luminus, well-known for their superior recordings in general and their support for Pure Audio Blu-ray in particular, have also eluded me thus far. That said, I was so impressed with the 24/192 download of this disc – sourced from eClassical – that I ‘upgraded’ to a DSD128 version supplied by NativeDSD. Downes kicks off with the multi-talented Morton Gould’s American Caprice, which she describes as a mixture of ‘sweetness and sass, bluster and blues’. And goodness, how accurate that proves to be. Downes is a lively, confident player and she brings out the shifting moods and perky rhythms of this piece very well indeed. The recording is crystal clear and pleasingly present, with every nudge and nuance perfectly conveyed. As for Lou Harrison’s three New York Waltzes they’re characterised by a disarming simplicity and directness that’s eminently engaging. Indeed, that last comment applies to the pianist, too. For me the highlight of this collection is Downes’s haunting – and very beautiful – rendition of Shenandoah. It actually moved me to tears, such is the ache and poise in every bar. It’s so well paced and proportioned, and for the first time I found myself in a rare state of immersion – of heightened sensitivity – that’s more typical of live concerts than recordings. Downes is the real magician here, but the gorgeous sound certainly helps. This is the kind of piano recording I dream about, where all artifice melts away and the pianist is right there in the room, playing for me and me alone. Quite extraordinary (and not a little spooky). I’m a great admirer of Amy Beach, and would urge curious listeners to investigate Kirsten Johnson’s fine traversal of the solo piano works. I’ve reviewed Vol. 2 and Vol. 3, the latter of which contains From Blackbird Hills, subtitled ‘Omaha Tribal Dance’. I wouldn’t say Downes supplants Johnson, but she has all the agility and focus the piece demands. So very different from the expansive and rather imposing spiritual Deep River, by the London-born, part-Creole Samuel Coleridge-Taylor. A composer of great promise – Hiawatha’s Wedding Feast is probably his best-known work – he succumbed to pneumonia when he was just 37. I’ve not come across Dan Visconti before, but the short, rather minimalist Nocturne from his Lonesome Roads is pleasing, if not entirely memorable. That said, those who want to hear more should seek out the complete recording (Bridge 9386). In keeping with one of the album’s binding narratives – long, often arduous journeys – Downes has included the Swiss-born emigré Ernest Bloch’s At Sea. Vigorous and sparkling it has a precipitous quality that speaks of anticipation tinged with dread. She navigates the turbulent waters with aplomb and rides the big surges with supreme confidence and well-deserved exhilaration. In short, a bravura display. If I have any reservations they’re of the nit-picking kind. Not all the music is of uniform quality – Nina Simone’s Gershwin arrangement is a little disappointing – and in terms of performance the Joplin could do with more shape and clarity. Even so, Downes’s enthusiasm for – and commitment to – these pieces is never in doubt. That’s also true of Puerto Rican Angélica Negrón’s Sueno Recurrente (Recurring Dream), which neatly combines the twin themes of journeys and the pursuit of better things. This little number’s mild dissonances and repeated figures are beautifully realised by pianist and engineers alike. As miniatures go Leonard Bernstein’s tribute to Stephen Sondheim – blink and you’ll miss it – is a little gem. As for David Sanford’s Promise – described by Downes as a piece about optimism and parental hopes for the future – it modulates from nursery tinklings to something much more ‘grown up’. It’s a work that lingers in the mind, which is why I listened to it several times in quick succession. Howard Hanson does the journey in reverse as it were, returning to the cradle with his utterly delightful Slumber Song. Downes, clear-eyed but never clinical, judges the mood, rhythms and gentle flourishes to perfection. Once again I hit the repeat button and marvelled anew at this lovely performance. We move to Broadway with Blue Skies, Irving Berlin’s hit song from the Rodgers and Hart musical Betsy (1926). Art Tatum’s irrepressible arrangement gets a fluid and funky outing here; Downes clearly relishes the music’s energetic, almost improvisatory style. This is another of those moments where I felt the magic was being made just for me. Ditto the African-American composer Florence Price’s Fantasie Negre. Although I’d not heard a note of this music before it didn’t take long to realise it’s very accomplished indeed. 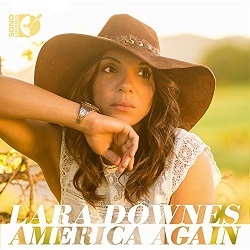 A passionate, even turbulent piece it also confirms Downes as a bold, intuitive artist, well up to the technical demands of anything she plays. Weighty, wide-ranging sound, too. Still in the 1920s we have Aaron Copland’s Sentimental Melody, originally the first of his Four Piano Blues (1926-1948). The artful interplay of left and right hand is brought forth so naturally that I can scarcely imagine the piece being played better than this. But if it’s melting musicianship you’re after Downes’s account of Duke Ellington’s Melancholia is hard to beat. Indeed, she’s at her most relaxed and introspective, those shifts and flourishes adroitly done. This pianist never gets in the way of the music, and that shines through in her receptive, open-hearted response to Roy Harris’s Li’l Boy Named David and, especially, her wistful account of Harold Arlen’s Over the Rainbow. What better way to end a collection inspired by hopes and dreams? Goodness knows we need more of both in these bewildering times. Perhaps that’s why this album was getting so much air time on US radio stations in the weeks after the election. Yes, these are very personal statements, as Downes’s confiding essay so amply demonstrate, but even without this context – I listened ‘blind’ the first time around – the album had me well and truly hooked. I was very happy with the 24/192 download of America Again, but those with the money and the right equipment should hear this DSD version; honestly, the astonishing fidelity and added presence more than justify the extra cost. As for NativeDSD’s website it’s well laid out and easy to navigate. Purchases are stored in one’s download history, but there’s also an option to upload them to DropBox for easy access. Support staff are friendly and they respond quickly to your queries, which is a welcome bonus. Spirit-lifting music, essayed with great feeling and a touching sense of purpose; the DSD download sets new standards for piano recordings.